As part of the cortege our highly maintained funeral vehicles conveys the deceased to their resting place. Each vehicle comes with a uniformed trained driver who will assist you throughout your journey. 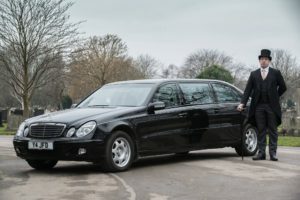 We can offer a wide range of funeral transport, we own our own traditional black fleet consisting of hearses and limousines. 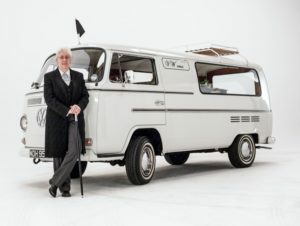 We can also provide horse-drawn carriages, motorcycle hearses, Volkswagen camper hearse and classic cars . If you think you would like alternative transport we will do our best to source it for you. Another beautiful horse and carriage funeral. The horses are called Dragon (on the left) and Daniel (on the right). Dragon has been in films such as Nanny McPhee and Robin Hood.